The Cinema du look movement was said to favour style over substance, spectacle over narrative, in fact a highly visual approach to film making. 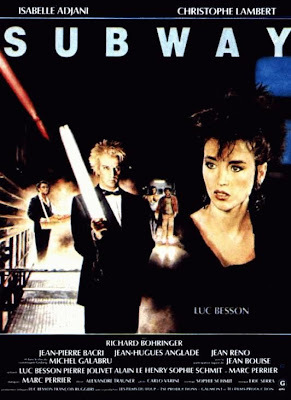 This movement existed between the 1980’s and the early 1990’s and a prime example of this type of movie is Luc Bresson’s 1985 Subway. Highly energetic, with a great opening car chase accompanied, as is most of the film, by a great soundtrack, the chase ends in the Paris Metro where almost all the remainder of the film is set. The story introduces us to a great concoction of characters starting with Fred (Christopher Lambert) who blows open safes. While attending a party he robs the safe of a rich Parisian gangster and relieves him of some undisclosed paper work: hence the opening car chase. Fred develops a relationship with Helena (the sultry Isabelle Adjani) who just so happens to be the wife of the Parisian gangster, she is bored with both her husband and her grand lifestyle preferring to spend time with Fred in the underground. Sharing their Metro existence are The Florist (Richard Bohringer) who earns his living selling wee bunches of flowers to the commuters, The Rollerskater (Jean-Hugues Anglade) who has a great line in bag snatching and dare we forget Besson regular Jean Reno as The Drummer tap tapping his way around the Metro. Attempting to police these miscreants is the coffee addicted Commissioner Gesberg (Michel Galabru) and his two aptly named assistants Inspector Batman and Robin. Fred resolves to form a band, one that can perform for the travellers who use the Metro. Subway was Luc Besson’s second feature film and one of the most popular films in France in 1986; it won Lambert a Cesar Award for best actor. An appealing stylish urban ‘underground’ fantasy from the early part of this fascinating French film director’s career. A quirky, but a decidedly entertaining watch.